Chocolate-chip cookies are all fine and good, and sure, sometimes you just need a sugar cookie. But there’s a world of exciting biscuits, bars, cakes, and other cookies out there just waiting for you. Read on to find your new favorite. Shake up your sandwich cookie game with Latin American alfajores. This buttery, melt-in-your-mouth variety marries crumbly shortbread biscuits with a creamy dulce de leche filling—and the combination is unbeatable. Alfajores are an especially versatile choice, regularly enjoyed with coffee or tea, as dessert, snack, or even breakfast. And who doesn’t love cookies for breakfast? There’s some debate about the origin of these rolled-oat cookies. Regional cookie lore says they were first baked and sent to the front by the wives of soldiers in the Australia New Zealand Army Corps (ANZAC) during World War I. Others say the biscuits were invented in a cookbook designed to raise funds for the soldiers. One way or another, these mild, sweet cookies have become a mainstay in kitchens and lunchboxes, especially on April 25, Anzac Day. The word kipferl has two meanings: first, any of the crescent-shaped pastries for which Austria is known; and two, as a pet name for a particularly foolish loved one. Sweeten your week with vanillekipferl—crumbly crescents made with ground walnuts and dusted with vanilla sugar. Quibble with the definition of “cookie” if you will, but once you try a nanaimo bar you’ll be glad we mentioned it. These no-bake treats first originated in the city of Nanaimo, Canada in the 1950s, and feature layers of crumbly wafer cookie, custard, and chocolate. If you like your snacks to bite back, paprenjak are the cookies for you. These traditional stamped biscuits are crispy and flavored with a heat-inducing blend of cloves, nutmeg, cinnamon, honey, and, most importantly, black pepper. These marvelous little cookies are bite-sized for a reason—to keep over-eager eaters from accidentally inhaling and choking on their powdered-sugar coating. Kourabiedes are similar in texture to Austrian vanillekipferl and Latin American polvorosa (see below) with one big difference: unusual butter. The best-known kourabiedes in Greece are made with buffalo-milk butter, and many home chefs swear by goat butter, which lends the cookies a light, rich flavor. Known variously as polvorosa, Mexican wedding cookies, or Russian tea cakes, these lovely treats are a perfect accompaniment for a cup of coffee or spiced wine. Just keep the napkins handy—the word “polvorosa” means “dust” or “powder,” which is exactly what you’ll get after your first bite. Stop into any bakery in India and you’ll find little mounds of the spiced shortbread cookies called nankhatai. The crispy little cookies get their creamy flavor from ghee, or clarified butter, and appear in kitchens across the country during Diwali. Looking for something a little more indulgent? Look no further than the Persian delight called reshteh khoshkar. Chefs mix rice flour, sugar, cardamom, walnut, ginger, and cinnamon, then cut the dough into thick strips—which are then deep-fried and drenched in cinnamon syrup. Drooling yet? If this list has taught us anything, it’s that the holidays are cookie time no matter where you go. The month of Ramadan is a time of fasting from dawn to sunset. When the marathon observance ends, Iraqis celebrate and break their fast, often with kleicha, rolled cookies stuffed with sweet and spicy date paste. Kleicha are so well-loved that many consider them Iraq’s national cookie. Cannolis and biscotti get all the attention, but Italy has plenty of other glorious sweet options to offer. Crisp on the outside, chewy on the inside, the petite almond-paste cookies called amaretti are a delight all their own. Enjoy them with dessert wine, crumble them on top of your gelato, or dunk them in your morning espresso. We won’t judge. Invented by a snack manufacturer in the 1970s, these satisfying little bites have become a mainstay on store shelves across Korea. The concept is simple—little ropes of dough, fried until crunchy and then coated in syrup and crushed peanuts—but the execution is awesome. Take your tastebuds to Africa with soft, mildly sweet mbatata. 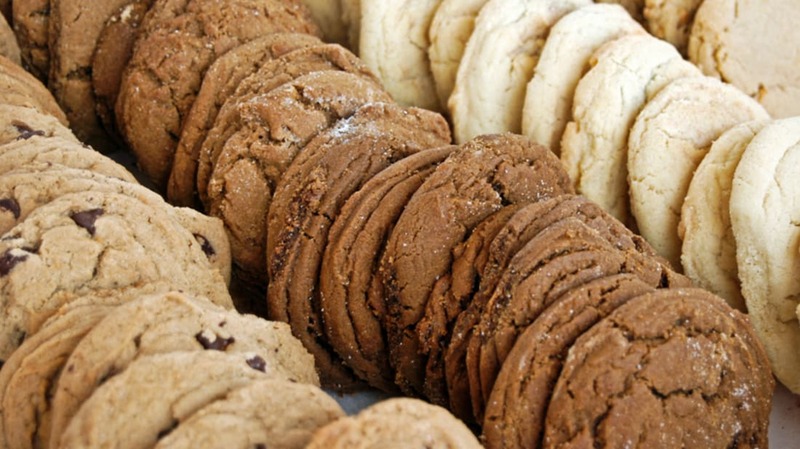 The secret to the cookies’ uniquely dense texture and delicate flavor? Mashed sweet potatoes. We’re not going to call these cookies healthy, but they would make an excellent vehicle for sneaking more produce into your kids’ diets. Enough talk about health; let’s head back to the deep-fryer. Mongolian boortsog are kind of like a cross between a donut and a cookie. The dough can be shaped into little balls, flowers, or animal shapes, and is often made with ghee or sweetened condensed milk. Unsurprisingly, kids love them. There’s a trick to eating stroopwafels. At room temperature, these thin waffle sandwich cookies are pretty darn good. But if you want the real deal, lay your stroopwafel across the top of a steaming mug of coffee. The heat and moisture will soften the waffles and melt the caramel filling, making it a beyond-perfect option for dunking.